CALL to ACTION: NO to PNP Posts in US! END All U.S. Aid to PNP & Human Rights Violations! NO to PNP Posts in U.S.
MALAYA Movement and BAYAN USA call on our members, allies and all people who stand for human rights to take action against the Philippine National Police’s Global Community Relations Program (GPCR) and call to END U.S. funding for the PNP and the Armed Forces of the Philippines (AFP). EXPOSE the Trump-backed Duterte administration’s attacks on the Filipino people by hosting EDUCATIONAL WORKSHOPS on Duterte’s 3 Dirty Wars, Neoliberalism and Contractualization, and Philippine Situationers, among others. Hear what LA Filipino community organizers have to say to the PNP and Duterte supporters’ ridiculous & reactionary comments. FOLLOW @BAYANUSA_Page & @MALAYAMOVEMENT on Facebook, Instagram, and Twitter. VISIT BayanUSA.org & MalayaMovement.com for more Updates and actions. On Friday, October 5th, 2018, the Philippine National Police (PNP) held a townhall at the Philippine Consulate in New York to promote its Global Police Community Relations (GPCR) program and to fundraise. The GPCR program aims to deploy PNP to outposts in the United States allegedly in San Francisco and somewhere on the east coast. The Global PCR is a desperate attempt by the PNP and the US-Duterte regime to salvage its reputation and distort the fact that over 23,000 lives have been killed in Duterte’s anti-poor policies like Oplan Tokhang and Oplan Tambay. 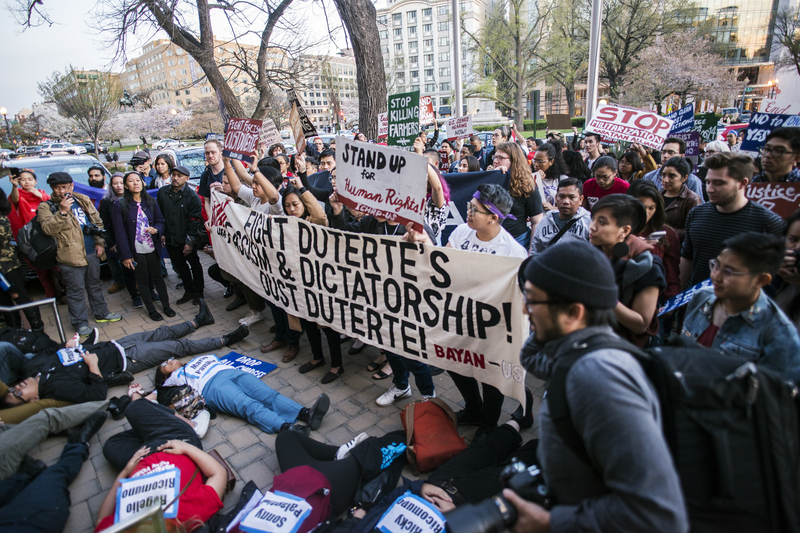 At the same time, it provides the PNP an opportunity to continue to harass, intimidate and surveil peace and human rights organizations, activists, and other community members based in the United States who voice criticism over Duterte’s violent and anti-people policies. We condemn the violent reaction by supporters of the PNP and Duterte who went as far as shoving, tackling, kicking, bruising, and harassing our members and comrades and resulted in the injury of two of them. This incident only further exposes the PNP’s role in dividing the community and repressing the voices of dissent. Under the Trump-backed Duterte administration, the PNP has been given carte blanche to do whatever they want with impunity, with a growing bloody track record of gross human rights violations including the the case of cold-blooded murder of 17 year old Kian De Los Santos by three PNP officers, as well as the 35 year old overseas Filipino worker (OFW) and cancer patient Alan Rafael who was unjustly detained, robbed, and beaten by PNP officers before dying due his injuries and lack of treatment. We salute the MALAYA Movement and BAYAN USA in the Northeast for engaging in a multi-faceted protest action that included holding a picket-line protest outside the Philippine Consulate, disruption of Philippine National Police (PNP) Chief Supt. (PCSUPT) Rhodel Sermonia’s presentation, as well as members participating in the question and answer portion of the townhall. Block the PNP Global Police and Community Relations Outposts! Cut all forms of US aid to the AFP and PNP! Stop Duterte’s Oplan Tokhang and Oplan Tambay! End State Fascism! Activism is Not a Crime!